The seeming decrepitude of America [in 1980] extended beyond the intellectual class to popular culture. 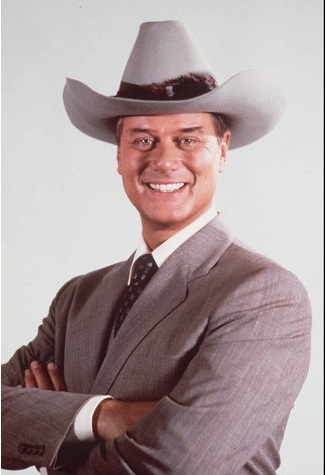 The highest-rated television program of the moment was the prime-time soap opera style drama Dallas, whose central character was a grasping, amoral oil man, J.R. Ewing. Ewing was the archetype anti-hero for the anti-heroic times, portraying what prosperity still existed to be wholly decadent. When an unknown assailant shot J.R. Ewing in the last show of spring 1980, “Who shot J.R.?” became an international obsession. London bookmakers gave odds on the suspected killers and took in several hundred thousand dollars in wagers. The episode that revealed the answer, broadcast two weeks after Reagan’s election in November, received the highest TV viewership in history up to that point. That the show centered around oil, the commodity thought to be at the heart of America’s economic difficulties, undoubtedly added to the show’s fascination. Dallas was hardly unique among Hollywood products; studies of TV shows and movies from the time found that a disproportionate number of films depicted businessmen and commerce as corrupt. The conclusion viewers drew was that private sector institutions were as dysfunctional as our political institutions. Dallas was also a huge hit internationally with a single curious exception. It did poorly in Japan, perhaps because commerce and businessmen were still regarded as heroic there? UPDATE: Our friends at Reason.com add a fascinating item on “How JR Ewing Saved Romania from Communism.” I may have to reconsider.